The goal of constituency parsing (also known as "phrase structure parsing") is to identify the phrases in the text. This can be useful when extracting information from text. Customers might want to find feature names or key phrases from a big body of text, and to see the modifiers and actions surrounding each such phrase. To a linguist, a phrase is more than just a sequence of words. To be a phrase, a group of words has to come together to play a specific role in the sentence. That group of words can be moved together or replaced as a whole, and the sentence should remain fluent and grammatical. I want to find a new hybrid automobile with Bluetooth. A new hybrid automobile with Bluetooth I want to find. I want to find a fancy new car. Find a new I want to hybrid automobile with Bluetooth. The results is very difficult to read and understand. 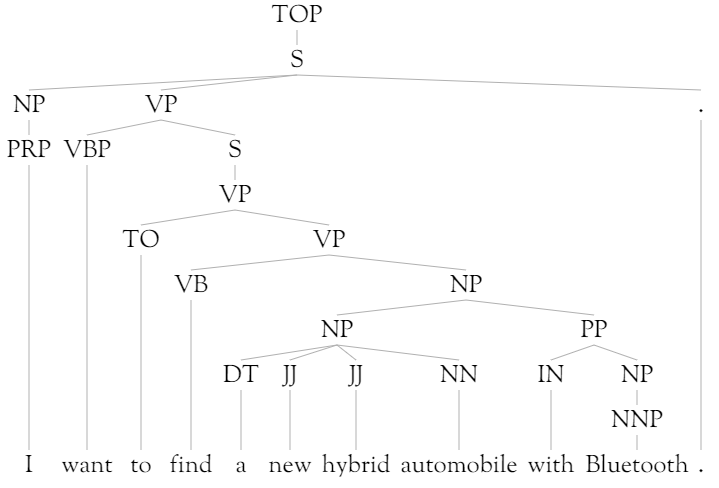 In this tree, the branches marked "NP" are noun phrases. There are several such phrases: I, a new hybrid automobile, Bluetooth, and a new hybrid automobile with Bluetooth. ADJP Adjective Phrase "so rude"
ADVP Adverb Phrase "clear through"
CONJP Conjunction Phrase "as well as"
FRAG Fragment, used for incomplete or fragmentary inputs "Highly recommended..."
LST List marker, including punctuation "#4)"
NAC Not A Constituent, used to indicate scoping of a non-constituent phrase "and for a good deal" in "you get things and for a good deal"
NP Noun Phrase "a tasty potato pancake"
PP Prepositional Phrase "in the pool"
PRT Particle "out" in "ripped out"
QP Quantity Phrase (i.e., complex measure/amount) within a Noun Phrase "around $75"
RRC Reduced Relative Clause. "still unresolved" in "many issues still unresolved"
S Sentence or clause. "This is a sentence." SBAR Subordinate clause, often introduced by a subordinating conjunction "as I left" in "I looked around as I left." SBARQ Direct question introduced by a wh-word or -phrase "What was the point?" SQ Inverted yes/no question, or main clause of a wh- question "Did they get the car?" VP Verb Phrase "ran into the woods"
WHADJP Wh-adjective Phrase "how uncomfortable"
WHNP Wh-noun Phrase "which potato", "how much soup"
WHPP Wh-prepositional Phrase "in which country"
X Unknown, uncertain, or unbracketable. first "the" in "the... the soup"
Trees here use the S-expressions from the Penn Treebank.